The database has 5301 scammers to date. It has the largest collection on the internet of male scammers operating on dating websites. This is an excellent option to search the scammers' database by first name, last name, country, city, phone number, email address, postal address, and the website he operates from. Before searching, always check spelling of their first and last name, the city name or other information you want in your search. Michael Freeman Lagos - you'll find all "Michael Freeman from Lagos"
Michael Freeman Nigeria - you'll find all "Michael Freeman from Nigeria"
You can also search using only a single keyword to get information about a scammer. You should also consider searching by their email address or a street name. In most cases, it is recommended that you use more than one keyword. 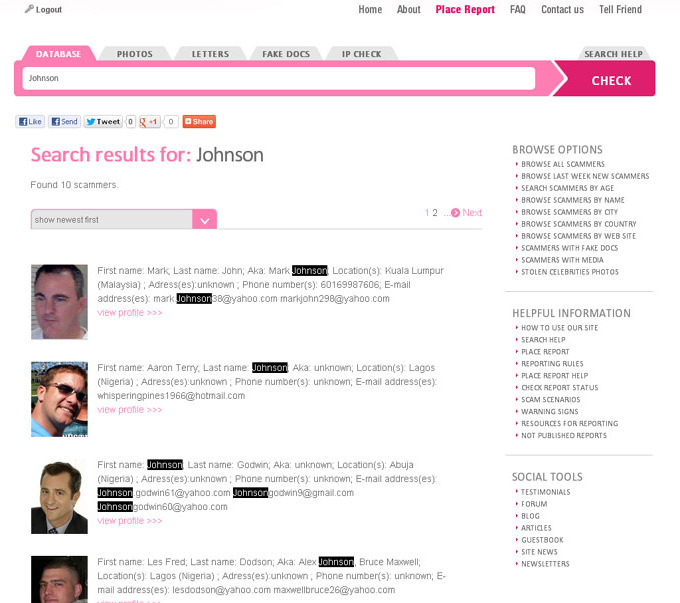 Search scripts perform searches by finding the specific occurrences of keywords that are in every scammer's profile. Stay away from using punctuation marks like brackets, numbers, hyphens, and general words such as "and", "or", "street", "house", "flat", "apartment", "city", "town", "village", "settlement", "state", "republic", "country" etc. You can search using parts of keywords: instead of "easymichaelfreeman99@gmail.com" use "easymichaelfreeman"; instead of "254775982698" use "25477598" etc.